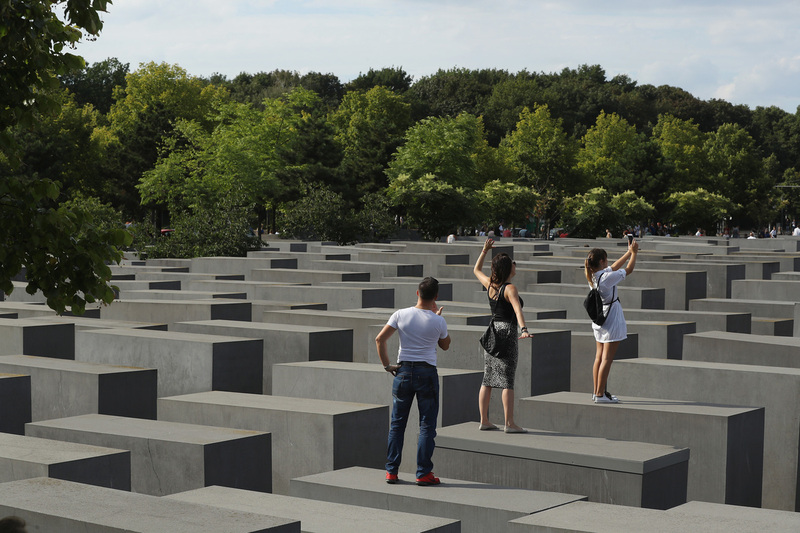 Satirist Takes Berlin Holocaust Memorial Selfie-Takers To Task : Parallels A Berlin-based Israeli satirist tweaks selfies taken at the memorial to elicit discomfort — and reflection. The memorial, he says, is "not just another backdrop for goofy selfies." Visitors photograph each other while standing on concrete slabs at the Holocaust Memorial in Berlin in 2016. At first glance, the snapshots featured on yolocaust.de look like any other ordinary selfies. People are smiling, dancing, juggling or striking a yoga pose. But if you move the mouse over an image, the background switches to black-and-white stills showing scenes of Nazi concentration camps. Suddenly, the pictures become profoundly disturbing. People are pictured dancing on corpses or juggling in mass graves. The photo montage series is Berlin-based Israeli satirist Shahak Shapira's response to visitors snapping what he sees as frivolous selfies at Berlin's Memorial to the Murdered Jews of Europe, Germany's national Holocaust memorial site. His project has sparked a debate over where to draw the line in an age in which most experiences are filtered through the lens of a smartphone and shared online. The name of his website — "Yolocaust" — is yet another provocation, with its reference to the acronym "you only live once." Shapira, 28, was born in Israel and emigrated to Germany at 14. His maternal grandfather narrowly escaped the gas chambers when Polish Christians hid him from the Nazis. His paternal grandfather, Amitzur Shapira, was one of 11 Israeli athletes murdered by the Palestinian terrorist group Black September at the Munich Olympic Games in 1972. Shapira takes umbrage at what he sees as the mindless behavior of posting selfies at a site marking the extermination of 6 million Jews. His aim, he tells NPR, is not to shame people or join the rampant backlash culture that dominates social media — but to "make people stop and think about where they are in the moment" and what it means to visit a memorial. Berlin's Holocaust memorial, an unrelenting grid of 2,711 concrete slabs located near the Brandenburg Gate, is "a place for reflection," Shapira says, "not just another backdrop for goofy selfies." Shapira had been thinking about the Yolocaust project for about a year before he launched it last week — the day after Bjoern Hoecke, a member of the right-wing, populist Alternative for Germany, or AfD party, called the memorial a "monument of shame" and called on Germans to stop atoning for the Nazi past. Hoecke's remarks sparked widespread outrage in a country where facing up to Nazi crimes is ingrained in the culture and education system. Even Frauke Petry, the AfD's leader, has distanced herself from Hoecke, describing him as a "burden for the party." But she did not overtly criticize his remarks, and on Monday, the AfD leadership decided against throwing Hoecke out. Hoecke's rhetoric is widely considered an election campaign tactic, part of an AfD strategy of "targeted provocations." Although the AfD is not represented in Germany's federal parliament, this could change when voters go to the polls in September. Shapira says his website is not a direct response to Hoecke's outburst but is propelled by his own concern about the political shift to the right in Europe and the U.S. In this vein, Shapira's uncomfortably tweaked selfies recall the anti-Nazi photo montages of Berlin artist John Heartfield, who, wanted by the SS, fled Germany in 1933. Heartfield's cut-and-paste political art appeared on the covers of anti-fascist publications in Germany, ridiculing Hitler and condemning the horrors of the Third Reich. Like Heartfield's jarring montages, Shapira's images are intended to shock, to agitate and challenge behavior — in this case, unthinking selfie habits. They've certainly received attention. Shapira's website immediately went viral, receiving more than 1.2 million hits within its first 24 hours. Shapira says he has received thank you emails from Jews around the world who lost family members in the Holocaust, as well as emails from history teachers and Holocaust researchers planning to use the website in their lessons and lectures. The German tabloid BZ Berlin called the idea "as simple as it is ingenious," but praise has not been universal. Some newspapers, like the conservative Frankfurter Allgemeine Zeitung, questioned the acceptability of using images of the dead in such a fashion. The British left-leaning weekly New Statesman voiced similar concerns — but about the selfie-takers, not victims of the Holocaust. Calling the project "worryingly sensationalist if not censorious," it asked whether publicly shaming visitors to the memorial — which is what many see Shapira as doing, regardless of his insistence otherwise — "risked shutting people out." The memorial's architect, Peter Eisenman, told Der Spiegel when it opened in 2005 that he didn't expect visitors to be overly reverent. "People are going to picnic" at the monument, he told the magazine. This week, in reaction to Shapira's website, Eisenman seemed unperturbed by selfies taken at the site. He told the BBC: "People have been jumping around on these pillars forever. I think it's fine." While Berlin's Holocaust memorial lists behavior it deems inappropriate for visitors — including jumping off the concrete slabs — some have questioned the ethics of Shapira's own online conduct, since the selfies he has altered on his site have been plucked from people's public social media profile pictures without permission. Those who find their photos on his site can request to have the images taken down. As of Tuesday, most people had done so, and Shapira says he has complied with the requests. "Almost everybody apologized," he says. Shapira hopes the remaining selfie owners get in touch. He expects the site to be empty in a couple of days. That, he says, will be its "ultimate success."